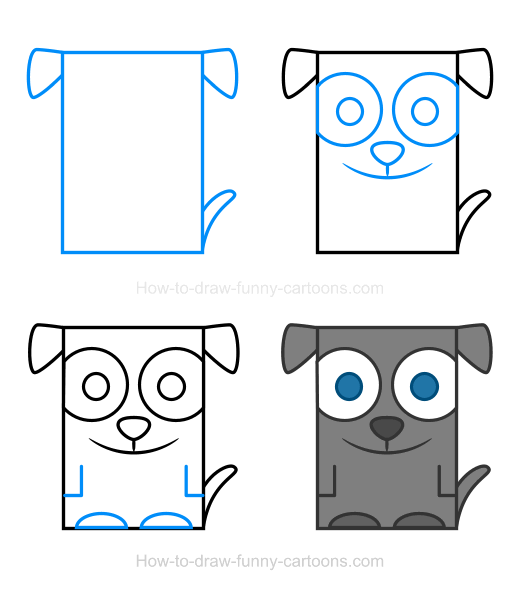 Illustrating this beautiful dog clipart can be done using a pencil and a piece of paper of a vector application. In both cases, you should be able to create this nice clipart image quite easily. It was designed for beginners and the character is made mostly from basic elements like circles and rectangles. Simple curved lines are also used to create this character. Dogs are wonderful creatures. Smart, agile and strong, these great companions have been around for a very long time. Domesticated for at least 25 000 years, dogs are also very helpful for police officers and customs officers. Let's try to illustrate the simple version found below in just four easy steps. First, let's draw the body and head using a large rectangle. The ears are made from simple curved lines as shown in the illustration below. Finally, you can add a small tail using once again a long curved line. All outlines must be thick and filled with a light grey color (as seen in step number 4). 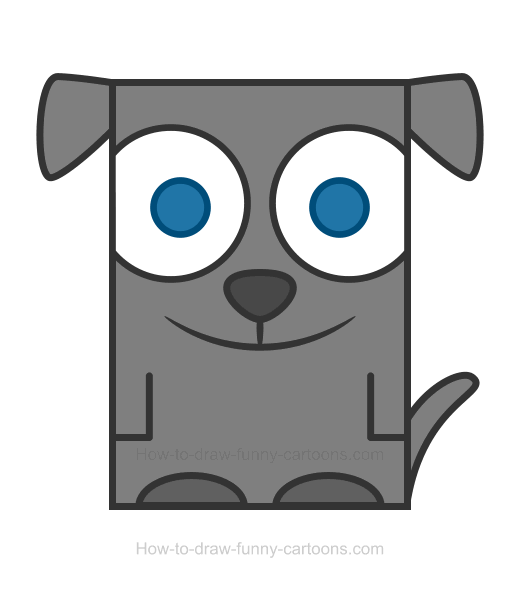 Next, you can work on the facial expression of the clipart animal. Start by drawing the eyes using large circles. Continue by sketching small pupils inside the eyes using more circles. The nose is made from a large oval shape. The mouth is created from a long curved line. 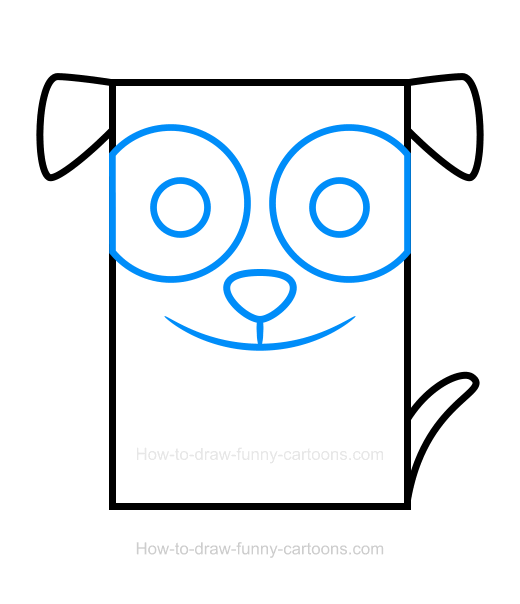 In this last step, draw the front legs (located just below the mouth) using long straight lines. 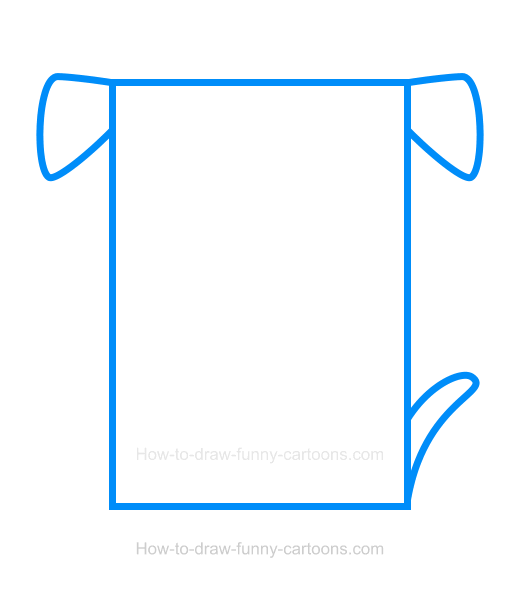 The back legs (on the bottom of the cartoon character) are made from simple curved lines. That's it! The drawing part of the tutorial is now completed. It's time to add colors. The pupils can be blue while the eyes are white. The body, the ears and the tail are filled with a light grey color. The nose and the back legs are filled with a darker version of the grey color used earlier.